If information is the superhighway then, the king of the road is the search engine. The short time in which the internet has become immensely accessible, search engines have become a useful tool. In fact, in the lives of the people, the idea of referring to a reference book or making phone calls to gather information is an anathema. Therefore, the present and the coming generations rely on Bing, Yahoo!, Google, or any other search engine websites to collect knowledge and information. What happens is that the users enter any word in the search bar and the website returns with numerous search results almost instantly. Since this technology is now easily available, the library and the Yellow Page books are starting to look prehistoric. The giant of the internet, Google, is presently so dominated that it performs more than 3.5 billion searches per day. Bing and Yahoo! are the next to follow this giant search engine. It is the dream of every business that it shows up on top of the search result so that it gets the highest marketing through the internet. This is being done nowadays by promoting on Google and other search engines and in return, these businesses get closer to the top result. If you are looking for a way to rank your webpage higher in the search result, the most basic thing you should do is to increase the number of websites that are connected to your web page. It is crucial to learn about the procedure to analyze the internet traffic via various ways. One way is that you open the website’s log files to find out how the viewer found your web page or website. It is important to know the significance of analyzing log files and traffic as these tools can help your webpage reach the top. If the search engine marketing is done properly and regularly, it can be among the best ways to market your website and attract huge traffic towards it. It is common among the people to ignore the significance of a proper marketing strategy and executing the strategy regularly. This is an avoidable situation and must not be ignored as it holds huge benefits for your business. To ignore the planning of a marketing strategy means that you are delaying the success of your business and certainly preventing it as well. Therefore, it is vital that you have the understanding and the knowledge of the search engine marketing (SEM) and the different ways of using it. Basically, these methods provide much needed traffic to your business and promote it so that you earn a huge profit. Search engine marketing is the process of promoting your website, business or any content by using either paid methods, free methods or a combination of joining both the methods of the search engine optimization (SEO). This result in the increase of your content’s ranking in the search engine result pages (SERPs). Short, yet really accurate, this is the basic job of search engine marketers. Among the many benefits that search engine marketing can provide, cost effectiveness is the major one. This can be demonstrated by using the pay-per-click methods. This method only charges you if a user clicks on your advertisement. Not only does this method let you feature the ads in the search engine result pages, where people can read the ad, but you only have to pay when the user clicks the ad. Next, if you learn the basics of the SEM, you will start looking for proven techniques and methods to increase your traffic. Every company has a longing for a huge traffic coming to their website. By properly using the SEM methods, you can increase the number of visits to your website so that your business flourishes. With the passage of time, SEM has out-struck almost every other method used for marketing and promotion. One of the biggest advantages SEM offers is that the costs and expenses applied through the marketing are comparatively less than other means and methods of marketing. There are different SEM offering companies, which have different clients. Whichever company you choose, their costs would be less than what the other modes of marketing offer. Another big advantage of SEM is that your advertisement would run twenty-four hours a day and seven days a week. All you have to do is choose the websites on the internet that you want to have your advertisement. If you wish to have the same days and hourly exposure through the other ways of marketing, your budget would easily be blown out of the window. Search engine marketing also allows a complete control over your campaign, your audience, and the campaign costs. Finally, increased traffic means increased promotions, which further means increased sales. When an increased number of people start getting to know about your company or any content on the website, many of these people will start converting into customers and clients. It is highly effective if you execute an email list building strategy. It is important that whatever you decide should be friendly to your budget at hand. What this means is that if you do not have a large sum of money available, paid advertisement methods should not be considered as an option. Rather the less expensive method, SEO, should be considered. However, search engine optimization has disadvantages as well. Conclusively, after filtering out the techniques that fall under your budget, the pros and cons of each method should be weighed and the best one should be chosen so that you are comfortable with. This type of search engine marketing uses paid reach to attract the visitors. The paid marketing methods (such as the pay-per-click method) provide fast results. However, they are expensive and one must always take a look at the budget before choosing any method. Search engine optimization (SEO) uses so-called organic reach so that the website or any content of the client is adjusted and rewritten in order to increase the visibility of that content in the search engine search results. 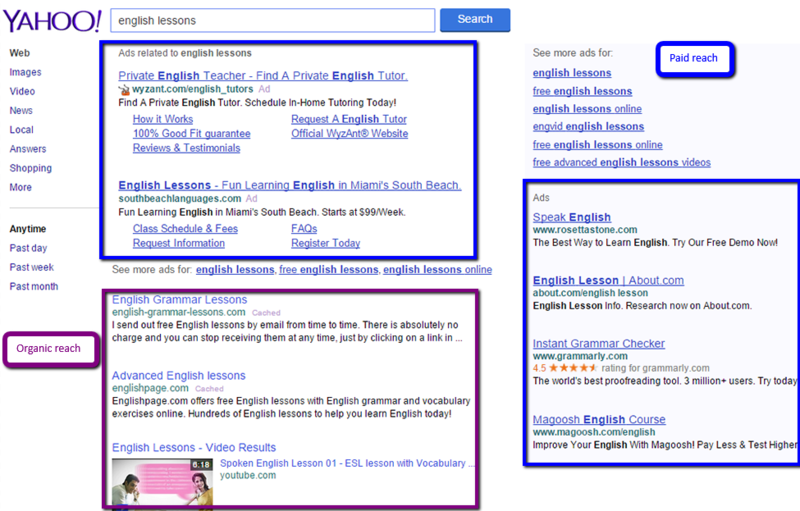 Paid advertising results are displayed at the top of the SERP, above the organic search results. Paid results can also be displayed on the side, and in the bottom of SERP. This step is further categorized into three steps. First, you need to make sure that the website can be included in the search engines according to the proper order. Next step is finding the most relevant and accurate keyword of the website that can sum up the content of the website in just a single word or a phrase. Finally, use that keyword on the website in such a way that it will show up high in the search result and attract an increased amount of internet user traffic. Progress on the effect on keyword research and analysis is known as the search perception impact. This describes the known impact of a search result, of any brand, on the perception of the consumer. This includes site indexing, meta tags, titles, and the focused keyword. Since searching online for something is the first step to becoming a customer, the search perception impact carves the impression of a brand for each person. Also known as the amount of website’s visibility in the search engines, website saturation can be examined by the number of pages of the website available in the search engines and the number of backlinks that the website has. In this method, it is a requirement that a keyword should be present in the pages, which the people can search for, as this would ensure a high rank in the search result. Many of the search engines make use of the link popularity to rank the different results. These tools give data on the visitors of the website and the site itself measures the success of that website. HTML validators and web analytic tools are the common tools used in this step. These tools can be as simple as counting the traffic that is arriving at a website, to tools that deal with log files and to complex tools that are based upon page tagging. These back-end tools deliver the information related to conversions as well. Large companies often combine the usage of several types of tools, so they could be using tools that analyze log files, tag-based investigative tools, and transition-based tools. The validators check for any invisible parts of the sites, highlight the possible problems and usage issues and then ensure that the site meets the requirements of the W3C. It is a good idea to use more than one spider simulator or HTML validator for these purposes, as each of these reports highlight and test different areas of the website. This tool discloses the owners of the website. These tools play an important role in providing valuable information regarding the copyright issues and trademark issues of the website. This is a method that involves the search engine companies to charge fees for including the website on their top search results. This method is also known as paid inclusion and sponsored listing. The products, that are to be advertised, show up on the separate ad-bar of the search engine, or show up at the top of the pages of the search engine results. With search engine website allowing paid inclusions only, they benefit a little from success. Search engines like Yahoo! support the stance of providing mix paid inclusions to the SEO and SEMs. The paid method used in search engine marketing includes advertising with search engine advertising programs, that allow users to create sponsored results that are to be displayed in the search engine result pages. Each search engine has some sort of advertising program, with Google AdWords and Bing Ads being the two most commonly used, due to a large number of searches conducted through these two search engines. This type of advertising is also called cost-per-click (CPC) advertising and it means that you pay any time someone clicks on your ad shown in the search engine result pages. This type of advertising is most commonly used by the advertisers as it requires payment only after your ad has been able to attract visitors to click on it. This advertising model is focused on the number of impressions, i.e. the number of times that your ad has been shown. Using this type of advertising you pay for each set of one thousand impressions. Every business believes and trusts in the potential of SEM. Since the previous decade, growth in search engine marketing has been immense, beating every other industry. As a large number of internet users keep utilizing the internet as their primary option, in finding the right company for their needs and wants, SEM will continue to prevail as the forefront leaders of marketing. Businesses have realized that the acquisition of cost is acceptable through SEM, causing an effective increase in the resources through savings in the marketing budgets. In case you have missed out in making a proper and formal search engine marketing strategy in the first place, or you have left some filler in the marketing budget used for SEM purpose, it is suggested that you rethink the strategy and consider the benefits that would lead your business and company on the mountains of success. All of this is essential, as the business needs to create a strong effective presence in the eyes of the search engines, especially Google. Carefully look into all the requirements and updates given by the search engines and organize a strategy accordingly. Paid reach is a frequently used method in the marketing strategy by a lot of companies nowadays. However, the search engine advertising programs are available to anyone, and they have become an important tool in developing and growing small businesses as well. In a modern business world where being positioned at the top of the result pages has become a signal of success, you need to do your best to increase the visibility of your website in relation to the keywords that are associated with your business. The main benefit of search engine advertising is the possibility to reach more clients, which are the users you would not be able to attract using organic reach only. This helps you expand your market as your business becomes visible to the new customers. Using paid advertising program allows you to be in charge of your campaign, by setting up the budget and the time period that budget is to be spent. This way, you will only spend the budget you have planned to assign to this type of campaign. As the campaign runs, you will be able to analyze the budget spending, and to adjust it accordingly. Each advertising program offers a platform for managing the campaign, which also provides the features for evaluating the performance of the campaign. Therefore, you can track conversions and make sure that your campaign is really successful. You can also monitor traffic and analyze how you can improve the strategy to yield best results. On a broader perspective, search engine marketing is a wider category that includes search engine optimization as well. As mentioned earlier, SEM includes both, organic search results and paid search results. Organic results are entirely based on search engine optimization, whereas paid search results include using advertising programs, such as Google AdWords and Bing Ads. Most of the time, SEM goes with paid advertisement with Bing Ads or Google AdWords. Pay-per-click advertising benefits the advertisers as potential customers can directly reach the company through one simple click. Advertising, article submissions and SEO are important factors when talking about paid advertisements. For both, SEM and SEO, a keyword analysis is conducted. However, it is not important that they have to be done at the same time. SEO and SEM require different ways of monitoring and upgrading. Upgrading should be done on a frequent basis, in order to be able to perform an analysis on the previous practices. In some cases, SEM term is used to denote PPC advertisement, so some advertisers identify SEM with PPC, with SEO being a separate type of marketing. Search engine marketing is an overall result of what is concluded from the users. The visitors from different directories and search engines voluntarily checked your business rather than considering any other competitors. One of the reasons why the internet users landed on your website was primarily because they were impressed by the offerings they saw. Always keep in mind: SEM is a non-intrusive approach used in marketing. Most of the advertisements, offline and online, always interrupt the consumer behavior. For example, when the users are surfing across the internet, they may encounter different pop-ups that are used as ads. On the other hand, reading a newspaper, the ads section dominates the mind of the users, forcing them to leave their reading in order to look at the ad. Through SEM, the users on the internet actively search for your information, services and products that were mentioned in the ad they saw. The ads they see in the search engines are relevant to the search query and their goal is to satisfy the need of the user. Therefore, instead of being intrusive and presenting a distraction, search engine ads are helpful and provide relevant information. The internet has rapidly developed since the past decade. From e-commerce shopping to connecting to people across the shores, everything is done under the blessing of the internet. As a vital part of the internet, search engines have allowed businesses to do wonders in their niche industry through essential factors like search engine optimization and search engine marketing. Search engine marketing (SEM) is the profound way of promoting and advertising businesses over the internet. Through different techniques and tricks, it is important for businesses to adopt this in order to add success in their business. SEM comes with mainly advantages, if the marketing is done in the right manner. One must never delay a marketing strategy, as it is a known fact that right marketing brings much needed success for every business. Every search engine has its own requirements when speaking about SEM. Google is the current king of search engines, leaving Bing and Yahoo! behind. There are different methods and ways to earn high ranks in search engines. Every search engine requires different SEM techniques as well. You should follow all the guidelines and recommendations in order to ensure success for your business.